Becker muscular dystrophy (BMD) is one of nine types of muscular dystrophy, a genetic, degenerative diseases primarily affecting voluntary muscles. It is named after German doctor Peter Emil Becker, who first described this variant of Duchenne Muscular Dsytrophy (DMD) in the 1950s. BMD is similar to DMD, but allows the voluntary muscles to function better than they do in DMD. The heart muscle, however, can be affected similarly to the way it is in DMD. 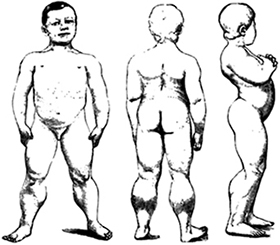 It is an X-linked recessive inherited disorder characterized by slowly progressive muscle weakness of the legs and pelvis. The rate of muscle degeneration varies a great deal from one person to another. Pain and sensation:- Some people report muscle cramps at times, which can be treated with over-the-counter painkillers. Heart:- the heart muscles also get weakened similar to limb muscles. This condition is known as cardiomyopathy, where cardiac muscles become weak and starts to deteriorate due to lack of Dsytrophin. This can be life-threatening. Brain power:- The learning problems seen in some people with BMD seem to occur in three general areas: attention focusing, verbal learning and memory, and emotional interaction. BMD occurs when a particular gene on the X chromosome fails to make sufficient levels of the protein dystrophin. Dystrophin plays a role in keeping muscle cells intact; lack of dystrophin causes cells to be fragile and easily damaged. There is no cure, but treatments are available to help with symptoms and maximize muscle function. It is vital that a person with a BMD stay in shape and continue to use their muscles. This can include physical therapy. Treatment can also include genetic counseling, using splints, massages, and catabolic steroids. All major neuromuscular disorders are identified with Vatadosha. In Ayurveda this pathogenesis can be clearly understood by the concept of Adibalapravrittavyadhi. Here the pathogenesis occur due to the Beejabhagavayava Dushti which leads to Mamsa Vata Dushti. The Ayurvedic treatments relevant to Rasayana group of herbo-mineral medicines and specified Panchakarma therapies have a definite protective influence and long survival on DhatuKshaya. Now the question is that how this disease is treated naturally without any side-effects? Planet Ayurveda offers an Ayurvedic treatment for this serious problem which helps to manage this problem to a great extent. The Founder and CEO of Planet Ayurveda, Dr. Vikram Chauhan, is an Ayuvedic physician and he formulated some herbal formulations with his experience and knowledge. These herbal remedies are 100 % natural and free from any chemical, preservatives fillers etc. Ashwagandha is also known as Withania somnifera. This herb, which is found in India, the Middle East and parts of Africa, has roots and berries that are used to make a tonic that provides a number of physical and mental health benefits. The capsules of ashwagandha contain standardized extract of Ashwagandha herb. Benefits:- Ashwagandha has the ability to promote weight gain and increase strength by supporting healthy muscle growth. It nourishes all your bodily tissues, including the joints & nerves. Dosage:- 1 capsule twice daily with plain water, after meals. Gotu Kola (Centella asiatica) has been called "A pharmacy in one herb". The capsules of Gotu kola consist of standardized extract of Gotu kola herb. Benefits:- In addition to a reputation as a brain and nerve tonic, Gotu Kola is also used for chronic and degenerative diseases. Gotu Kola has been referred to as a rasayana (rasayana = rejuvenative measures that impart biological sustenance to bodily tissues) used to revitalize brain and nervous system function and combat the effects of aging. Several folklore, legends give Gotu Kola partial credit for claims of longevity and stamina. This formulation consists of standardized extracts if these two herbs; Safed Musli and Gokshura. Both herbs are very useful for increasing the stamina, and are aphrodisiac & adaptogenic in nature. Safed Musli is a Rasayana which is actively used as an adaptogen and has aphrodisiac properties. The carbohydrates present in this herb are important in keeping mucles energized and preventing muscular atrophy. Gokshura (Tribulus terrestris) is an herb with multiple uses. Gokshura is beneficial for body building and the minerals present in this herb can improve body composition and muscle strength. Makarprash is a revitalizing health tonic. It acts as an immunity builder. A powerful Rejuvenator to meet growing demands & helps to boost performance. Boswellia Curcumin is the most effective formulation for anti-inflammatory activity. This combination has powerful results in relieving joint pain and swelling around the joints. The capsules are made with a standardized extract of Boswellia and Curcumin. Benefits:- Boswellia Curcumin improves the health of joints by promoting circulation and flexibility of the joints. Brahmi Ghrita Benefits:- It is widely used as medicine and also in a preparatory procedure called snehakarma for the treatment of improving learning skills, intelligence, memory, speech. It is also used in the treatment of skin diseases, epilepsy and female infertility. Reportedly overcomes impotency. It is used for treating depression, fatigue, myalgia – depression induced bodyache and Stress disorder. Dosage:- 1/2 spoon with hot milk / water.